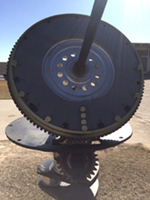 An equatorial sundial made of diesel engine parts by the students of Lureen B. Wallace Community College, under the guidance of Eddie Spann, instructor for diesel and heavy equipment and designed by the college president, Dr. Herbert Riedel. The stand is a crankshaft from a Cummins engine, while the dial base and dial faceplate are flywheels. The gnomon is a heavy duty diesel cylinder liner puller. The gear teeth on the faceplate mesh with a small gear to allow easy adjustment for the equation of time. Hours are marked by bolts, and on the winter side are painted hour numbers. 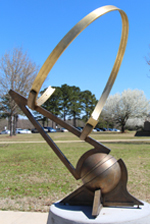 A 5 foot bronze and steel equatorial dial with pinhole gnomon in front of the North River Yacht Club.